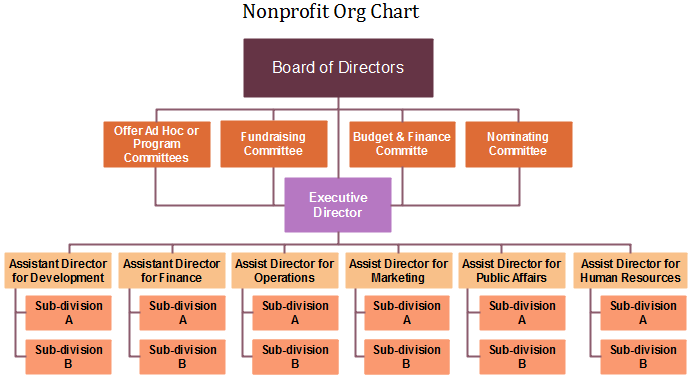 What Is a Nonprofit Org Chart? 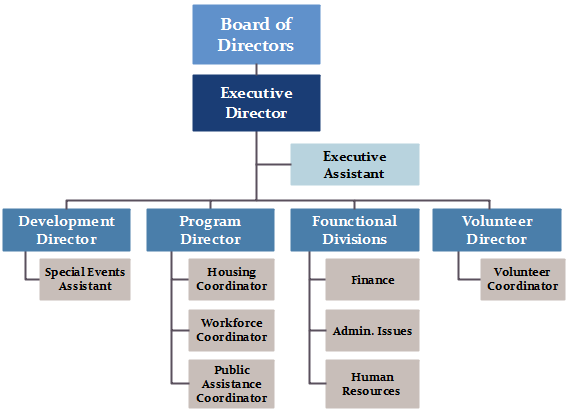 A nonprofit org chart shows the organizational structure for a nonprofit institution (NOP). In reality, NOP parties are normally not driven by business profit, and such types are often used for trusts, cooperatives, charity and religious groups. Here comes a template for a nonprofit organization. Overall, the sub-departments are in a similar pattern with profit organizational structures because you can clearly see the sections for Human Resources, Marketing, and development etc. However, there is a Fundraising Committee in the diagram below, which is different from commercial organizations. Here is another nonprofit org chart template in a more simple structure. A Volunteer Director is assigned to one of the management positions of the institution. Additionally, the NPO include some supportive roles, like the Executive Assistant. How Does a NPO Organization Operate? The majority of NPOs staff in management levels have salaries, and NPO leaders pick volunteers regularly from different social groups. For financial aspect, the top management directors do not own surplus profits. Instead, any operating surplus fund is for the further common goal of the organization. Actually, funding management is quite important in NPOs, which may cause problems if there is a lack of continuous donations. What are Some Practical Examples of NPOs? So far many countries and locations have NPOs, such as Australia, Belgium, Canada, India, Russia, South Africa and so on. Besides, the most famous NPOs in the U.S.A. include the Feeding America, the American Red Cross, the American Museum of Natural History, and the New York Public Library etc. Some other popular worldwide NOPs are the United Nations Children’s Fund (UNICEF), the World Wildlife Fund (WWF), and the Oxfam International. How to Create a Nonprofit Org Chart? This article Org chart creator would help you a lot. Simply get started with a quick free download. Alternatively, feel free to use this easy org chart creator for more advanced settings and management of your business teams.